Occasionally, CT likes to explore his Welsh heritage. When we woke up this morning, he announced, “it’s the 1st of March, St David’s Day. Why don’t we have leeks?”. Well why not indeed. With Shrove Tuesday fast approaching, pancakes were on my mind and I’d been planning to make some for breakfast, so why not make them savoury. In fact, why not go one step further and make Welsh pancakes. 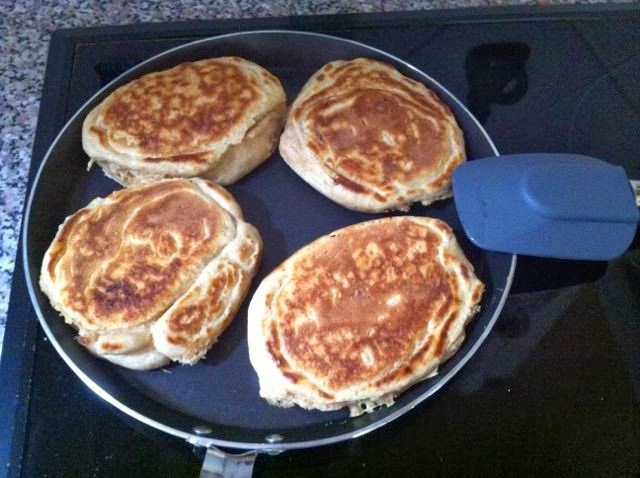 Crempog, as it is known in Welsh is a small thick pancake resembling a Scotch pancake. It is less sweet and fatty than its better known American cousin, but is normally served with sugar or golden syrup. 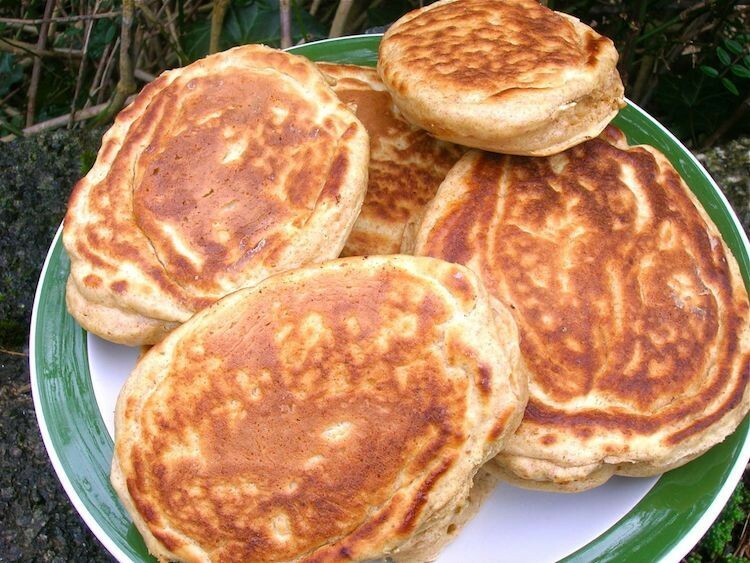 Traditionally, Welsh pancakes or Crempogau are cooked on a bakestone, rather like Welsh cakes. Sadly, we don’t have one of those, so a frying pan had to suffice. CT reckons that the French crèpes and the English crumpet might be derived from the same word as crempog. As it happens, they are often served on St David’s Day as well as on Shrove Tuesday, otherwise known as Pancake Day. Pancakes used to be made with yeast, but when bicarbonate of soda became widely available in the late 19th century, people switched over as this was more convenient to use. So rather than sprinkling our crempog with sugar, I made a leek and mushroom chocolate sauce instead. I had a brand new frying pan and spatula to use for the occasion provided by Sainsbury’s, so was looking forward to seeing how all this turned out. The frying pan worked really well, virtually no butter was required and nothing stuck – result! Although I made the crempogau rather larger than I’d intended, we were both very impressed with them. They rose well and were light and tasty. They were also quite thick. We cut some of them in half and spread with my blood orange curd, which was a very enjoyable way to eat them indeed. The leek, mushroom chocolate sauce was delicious too and also went very well with the pancakes. This made for a filling and fortifying brunch to set us up for our journey to Cotehele for Graft, Sow and Grow which is on today and tomorrow. Perhaps not the best way to celebrate a Saint who was no doubt into abstinence, but I defy St David himself not to have indulged if presented with a plateful of these crempogau. Welsh Pancakes, aka crempogau, are delicious in their own right. Here they are served with a savoury leek & mushroom chocolate sauce, but can just as well be drizzled with maple syrup, a sweet chocolate sauce or fruit curd. Sift the flours into a bowl together with the bicarbonate of soda. Make a well in the centre and crack in the eggs. Stir from the centre out, gradually adding the sour milk until all is well mixed. Cover the bowl with a tea towel and leave to stand for an hour. Heat a non-stick frying pan to a medium level, add a slither of butter and drop in heaped spoonfuls of batter. Allow to cook for a 3-4 minutes, then turn to cook the other side also for a 3-4 minutes. Place on a warm plate and put in a low oven to keep warm until all the pancakes are cooked. Sauté the leek in olive oil until soft. Add the butter, garlic and chestnut mushrooms. Continue cooking for a few minutes, stirring occasionally until the mushrooms look done. Add the double cream, milk and cheddar and stir until the cheese has melted. Grate in a good bit of nutmeg and the chocolate and stir until melted. Spoon the sauce over the pancakes and scatter on some snipped chives and a little grated 100% chocolate. I am excited to be entering these Welsh pancakes into Karen’s Cooking with Herbs over at Lavender and Lovage. It’s not often I get to combine herbs and chocolate. The specific theme is rosemary this month, but any herb is accepted so these chives will have to do. I was sent a Sainsbury’s voucher to buy the ingredients for this recipe along with a frying pan and spatula. There was no requirement to write a positive review. As always, all opinions are my own. I love the idea of a leek and chocolate sauce. How brill. Thanks Bintu – chocolate goes really well with mushrooms and the leeks were fine too. Chocolate sauce with leek and mushroom…what an exciting and fun idea! Chocolate in a leek and mushroom sauce – would never have thought of that! You’re just so wonderfully brave with your chocolate and savoury ingredients. This looks so luscious. I could dig into that stack quite merrily! Thank you Karen, maybe I should rebrand myself as The Cocoa Pioneer. Forgot to say a BIG thanks for entering this into Cooking with Herbs too! Such an innovative entry! I was wondering how you were going to get the chocolate into that recipe! How intriguing, I’d never have thought of a chocolate and mushroom combo. Oh chocolate and mushroom goes really well together Janice. Try mushroom and chocolate risotto – recipe is on the blog. Thanks Katie, it was really the flavour of the mushrooms that came through and as you say they do work well with chocolate. Thank you Deena, they were indeed fluffy and light and delicious. Thanks Sylvia. I like experimenting with savoury chocolate concoctions. They look wonderful. I would like them hot with butter, mmmmmmmm! Haha, is that a polite way of saying you’d rather not have the leek and chocolate sauce Jac? I had to read this post twice Leek mushroom and chocolate??? Very innovative I wonder how they taste. Well, we both thought they tasted good – lots of umami. So impressive – your crempogau look light and wonderful and I love the speckled effect you get from the spelt flour. As for the sauce, I can only echo other comments – wow! So inventive and yet totally delicious. Yes, I’m sure that St David would have wolfed them down as would I ! tee hee, pancake selfies! what is the world coming to!!! just love how FLUFFY the pancakes look Choclette, one query will butter milk do instead of sour milk or am being a klutz and its the same thing?Would never have imagined combining chocolate into the sauce! Thank Manjirik. No sour milk isn’t the same thing as buttermilk, but it has the same affect as buttermilk, which I think is what the original recipe stated. Dare? And you a chilli head? Of course you would dare Vanesther. I love how you manage to create savoury dishes with chocolate. These welsh cakes look delicious. Thanks Tina, I do like to explore different flavours with chocolate. Chocolate and mushrooms work really well together. I’ve used the combination a few times, especially good in mushroom risotto. I was planning on making savoury pancakes tonight for the monsters tea BUT they ended up with them for breakfast and at school, so may just be a pancake overload! Great idea turning welsh cakes into a pancake stack with a savoury sauce (which sounds delish btw! ), totally yum! Lately I’ve been thinking about how to incorporate chocolate into some savory recipes. This is certainly an interesting and unique application!